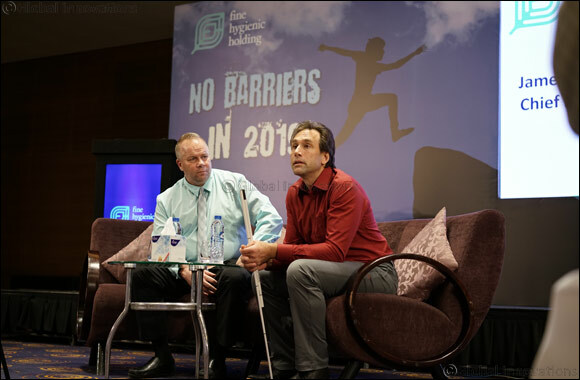 Dubai, UAE – 13 December 2018: Fine Hygienic Holding (FHH), one of the world's leading manufacturers of hygienic paper products, hosted Erik Weihenmayer, a visually-impaired mountaineering hero, at an event called ‘No Barriers' in Dubai last night. Weihenmayer spoke about his perseverance, bravery and accomplishments, including the ascent of the highest peaks on each of the seven continents during the event, which was co-hosted by James Michael Lafferty, CEO of FHH. FHH is hosting a series of ‘No Barriers' events in December for Erik's visit to the Middle East as part of its drive to motivate and empower employees and partners to reach their full potential. As an American adventurer, activist, athlete, author and motivational speaker, Weihenmayer was the first blind person to reach the summit of Mount Everest in May 2001. Gaining prominence for his incredible accomplishments, Erik was featured on the cover of Time Magazine in 2001. In 2005, he co-founded the “No Barriers” organization to teach people of diverse backgrounds and abilities about finding their inner strength to overcome any obstacle. He has given motivational talks at some of the largest companies in the world. Fine was honoured to host Weihenmayer for a series of “No Barriers” events during December where he addressed employees, partners, select customers, and other stakeholders, inspiring them to break through barriers in their own lives. He also met with Noor Dubai Foundation, a UAE based charity launched by His Highness Sheikh Mohammad bin Rashid Al Maktoum, with the vision of a world free from avoidable causes of blindness. The series of “No Barriers” events organized by FHH took place on December 10 and 11 during Erik's visit to the UAE and were hosted by Fine. FHH one of the world's leading manufacturers of hygienic paper products, believes that empowering people is the key to success.